Andy’s Maritime Antiques and Army Surplus Store, 29 St Vincent Road, Southsea PO5 2QR A new warehouse location has brought maritime antiques and army surplus under one roof. Ship bells, wheels, sextants and lighting. Travel the seven seas with the shining bronze telescopes or portholes. Rummage through the huge stock of camouflaged jackets, cosy coats, shirts, and hats, all at knock down prices. Also at: 25 Charlotte Street, Portsmouth PO1 4AH. Opening times: Monday to Saturday (10-5pm). Antiques Storehouse Naval Dockyard, Main Road, HM Naval Base, Portsmouth PO1 3PX Walk past the security guards (you don’t need a ticket to enter the Historic dockyard) and discover both the world’s and Portsmouth’s history in this warehouse-style shop. Vast shelves display model ships, pistols, medals and naval books. It has an eclectic mix of antiques. Jewellery, chinaware, vases, clocks, and antique toys you probably wouldn’t want your children to play with. Opening times: Monday to Sunday (9am-5pm). Bellamy’s, 83 Albert Road, Southsea PO5 2SG Look out for this elegant, former shoe shop (Corbins), with its high ceilings and bowed windows. Inside lies a carefully curated collection of outdoor furniture, urns, chandeliers and a wide range of jewellery. Also available is a charming collection of Staffordshire figures and graceful items of furniture. Brocante, 75 Castle Road, Southsea PO5 3AY Brocante. French for ‘flea market’ as much of the stock is imported directly from France. Plus British Victorian knick-knacks, sculpture, and books. A wide range of paintings and prints including some of Portsmouth’s seafront. A wide range of furniture and garden ware, music boxes, and stuffed toys. A bohemian gem. Opening times: Monday to Saturday (10am-5pm). The Goods Yard: Goldsmiths Avenue, Portsmouth PO4 OBT (Park in Johnsons Paint car park next door) Chat with the knowledgeable Colin Macleod in his large showroom, a former banana warehouse, filled with gleaming quality furniture at reasonable prices. Get your doors, floorboards and radiators stripped, or buy them ready to go from an extensive stock. Also to be found are door furniture, chinaware, glass, silver, and ornaments. Elegant garden statues and outdoor furniture add to the ambience. Opening times: Monday to Saturday (8am-4pm). Head Case Curios, 4 Albert Road, Southsea, PO5 2SH Primarily a shop catering for Steam punk enthusiasts, filled with replica weapons, tall hats, pocket watches and the macabre. But look closely and you will also find genuine antiques, gothic furniture, taxidermy, and vintage cameras. Opening times: Tues to Sunday 10am-5pm. Sunday 11am-2pm (in winter). Hillfield Trading, 65 Castle Road, Southsea PO5 3AY A bright red exterior makes this shop easy to spot. Primarily vintage, with several dealers showing small collections. Cameras, industrial furniture, pottery, and exotic masks from faraway lands. Sells prints and tattoo drawings by local artists, plus quirky sheet music art, and a line of printed T shirts. Opening times: Tuesday to Saturday (11am-5pm) and Sunday (11am-3pm). Langford Antiques, 70 Albert Road, Southsea PO5 2SL An Aladdin’s cave. Have fun exploring the overflowing show rooms on two floors. A wide range of antiques and vintage baubles. Good for furnishings, including plush chairs. Quality oil paintings, prints and photographs, portals to another time. Vivid lights and glitzy jewellery decorate the shop windows. Its lively ambience will make you feel at home. Opening times: Tuesday, Thursday and Friday (12-5:30pm). Saturday (11:30am-6:30pm). ONE LEGGED JOCKEY, 9 Marmion Road, Southsea PO5 2AT Established in 1984, primarily a vintage clothing outlet, but you will also see vintage artefacts galore, mainly from the 1950-60s, allowing baby boomers a glimpse of their childhood. See toys, cigarette cases, tea sets and chunky jewellery. Plus generic ‘60s pictures, and an impressive collection of German Lava vases. Parmiters Antiques, 2 Exmouth Road, Southsea PO5 2QL Opposite the Kings Theatre. 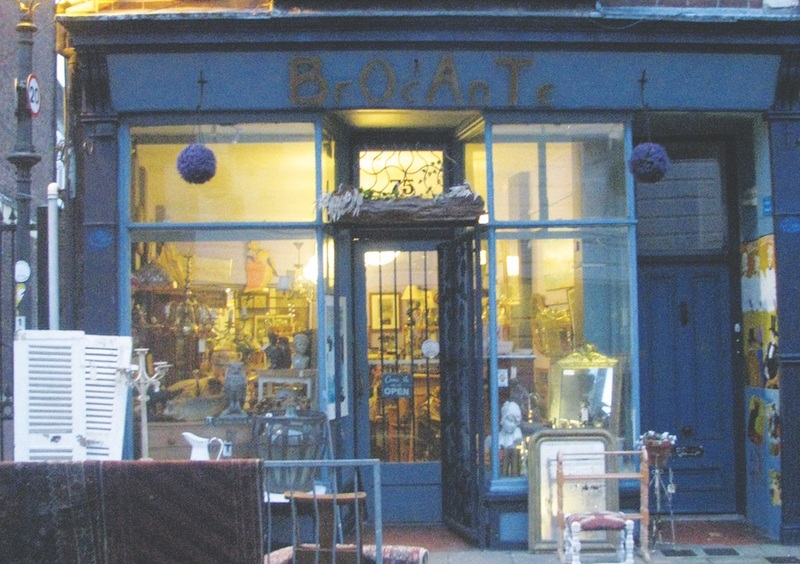 A small shop with an unending supply of unusual, or downright eccentric items, including: classical sculpture and architectural salvage next to anatomical charts, suitcases, quirky shop signs, fairground artefacts and gothic gargoyles. New additions to the collection arriving weekly. Revive Interiors 85 Castle Road, Southsea PO5 3AY If you prefer your vintage furniture painted and restored, take a stroll to the Common via Castle Road and pop into this double fronted shop for a browse. Other stock includes a mix of retro and vintage homeware, mirrors, lamps, and ceramics. Portsmouth’s only stockist of Autentico chalk paints. Opening times Tues to Sun 10am-5pm (Sun 11 am-3pm). Roberts of Southsea: 60 Castle Road, Southsea PO5 3AZ A cornucopia of treasures in this corner shop. Check out its constantly changing antique furniture, often pieces on a grand scale, good jewellery, glass and silverware, and the occasional large dramatic sculpture. Oil paintings and black-and white photographs cover the walls. Ticking clocks add to the atmosphere. Opening times: Monday to Saturday (12-5pm). Tango Tea Collectibles, 3 Albert Road, Southsea PO5 2SE Quirky, easy to live with items, specialising in 20th Century and Art deco homeware, lighting, and collectables. Owned by Jenni & Geoff Catlow. Both artists, Geoff also shows his striking pictures in the shop. Quality picture framing undertaken. Holds a prized collection of textiles, jewellery and ceramics. Knitted items, colourful Kashmir rugs. Opening times: Monday and Tuesday, Thursday and Friday (11am-4pm). Saturday (9am-1pm).